The notorious late-term abortionist LeRoy Carhart, 75, who has killed one abortion patient and hospitalized at least 15 others in the past five years, has seriously injured yet another abortion patient, who required emergency medical intervention and hospitalization. Emergency units were dispatched to Carhart’s dilapidated Abortion and Contraception Clinic of Nebraska, located in the Omaha suburb of Bellevue, in response to a 911 call place at approximately 3:08 p.m. on Friday, March 24, 2017. The fire unit was first on the scene, followed minutes later by an ambulance. According to emergency dispatch radio traffic obtained by Operation Rescue, the patient was a 35-year old female who had just completed at abortion of her baby at 17-weeks gestation. The woman suffered from difficulty breathing and excessive bleeding that Carhart and a second physician were incapable of controlling at the run-down facility where Carhart has operated for decades. This once again raises questions about the safety of women seeking abortions at stand-alone facilities that are not equipped to cope with the many life-threatening complications that can arise, especially during the riskier second and third trimester abortions for which Carhart is well known. Paramedics spent 17 minutes inside the facility before transporting the injured woman using Code 2 to Bellevue Medical Center. Code 2 represents an acute but non-time critical transport that does not require lights and sirens. 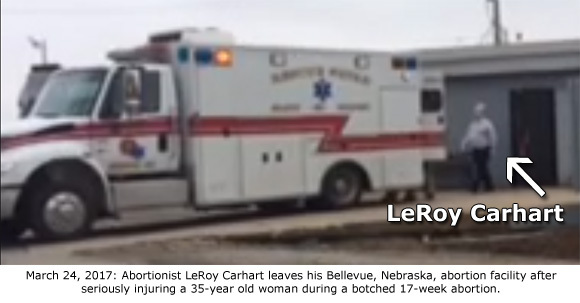 Carhart was seen on the video exiting his abortion facility and climbing into the ambulance so he could accompany his patient to the hospital – something Carhart rarely does. However, the aging abortionist holds no hospital privileges and would not be allowed to continue treating her (perhaps thankfully) once she reached the hospital. “Only a political climate that is bent on protecting abortionists at any costs has kept a shoddy abortionist like Carhart in business. Corrupt abortion attorneys shield him from the consequences of his actions, which are much more akin to those of Josef Mengle than Albert Schweitzer,” said Newman. Carhart is currently being sued by former abortion patient Wendy Devine, who is alleging that LeRoy Carhart so severely botched her late-term at Germantown Reproductive Health Services in Germantown, Maryland, that she nearly died and will likely never bear another child. Carhart was also under investigation by the House Select Investigative Panel on Infant Lives for suspected participation in the illegal sale of aborted baby remains, and for possible violations of the Born Alive Infant Protection Act. Unfortunately, the Panel ended before the investigation could be concluded. Below are other medical emergencies involving LeRoy Carhart that have occurred over the past five years.